Clear your throat and get ready to sing along to the classic Twelve Days Of Christmas soundtrack that plays out in the background of the Deck the Halls slot machine which is guaranteed to get you into the festive spirit. While you may feel strange playing a Christmas themed slot outside of December, it’s simply too hard to resist the fabulous gifts on offer which Santa Claus delivers personally! With boughs of holly and baubles decorating the 5 reels and 30 paylines, Deck the Halls is just one of many Christmas themed slots that have been released by Microgaming (with the Ho Ho Ho slot machine and the Santa Paws slot machine being two of their most popular titles) and it could well see you hang your decorations months in advance of December due to how excited it will get you – there are no gimmicks here, simply good old-fashioned Christmas spirit! You can deck the halls and start the festive proceedings from as little as 30p for those of you who like to stick to a budget and not go overboard, while for those of you who love to go all-out you can splash out up to £60 each time. It’s well worth it too as you could see Santa Claus stacked and bells ringing is a sign that you’ve been gifted a free spins feature where you could win up to 2,400,000 coins! You simply can’t fail to get into the festive spirit once you see the symbols that feature on the reels of the Deck the Halls slot machine with them all contributing to a wonderful traditional Christmas encounter that you will be remembering for many years to come. 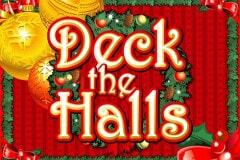 It’s the Deck the Halls logo which is the key symbol here as it is the most valuable of all offering wins of up to 4,000 coins should you find five on a single line, and it is actually one of two Wild symbols, along with Santa Claus who is worth up to 1,000 coins. While Santa Claus can appear as a Stacked Wild symbol in both the base game and free spins mode, the Deck the Halls symbol only appears Stacked in the free spins mode. As you spin the reels you will hope to hear the sound of bells ringing out loudly as these bring wins of between 2x your stake and 100x your stake and could see you spinning the reels for free, and there are plenty of other Christmas related symbols to get you in the festive spirits – thankfully no playing card icons have been used which is a pleasant change. You’ll see a beautifully decorated Christmas tree that is covered in baubles, tinsel and lights with lots of presents surrounding it which is worth up to 500 coins, a fireplace with the fire roaring and two stockings hanging from the mantel piece that brings up to 400 coins, a delicious turkey to sink your teeth into that is worth up to 300 coins, a selection of presents for you to unwrap for up to 200 coins, plus there is an assortment of decorations for the tree with a shining star, a reindeer, golden baubles, a light, and cones all featuring. Hearing bells ring loudly could be an alert that you’ve been gifted a bunch of free spins, however you’ll need a minimum of three sets to ring at once. Landing three sets of golden bells brings you 3x your stake, four and it’s 10x your stake, while the maximum of five will see you dancing around your hall celebrating a gift worth 100x your stake, and that’s only the beginning. You will be rewarded with 10 free spins with both the Deck the Halls and Santa Claus symbols being Stacked Wilds, plus all winnings will have a 4x multiplier applied to them which will certainly make you jolly! Christmas is known as the season to be jolly, and you’ll definitely be feeling jolly spinning the reels of the Deck the Halls slot machine. With a stunning design that showcases a traditional Christmas, you’ll have Stacked Wild symbols to increase your chances of winning and could find yourself being gifted a very lucrative free spins mode that could see the costs of the next few Christmases covered!